We specialize in pond stocking in a wide region including Tennessee, Kentucky, Georgia, Alabama, Mississippi, and Arkansas. 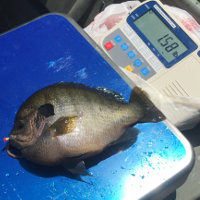 Chances are that if you have an Alabama pond you’re serious about making it into a top-flight fishing retreat, if you have bluegill in it, or if it’s a new pond, you have a plan to stock them. 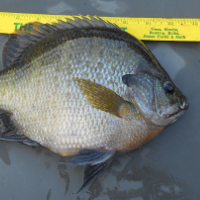 Why does it matter what kind of bluegill you stock in your pond? 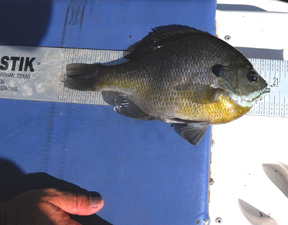 Even in Tennessee, the climate is such that coppernose and hand-painteds both grow significantly larger than northern-strain bluegill; and Alabama, of course, has a warmer climate still. 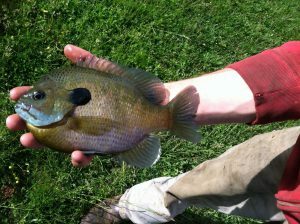 Coppernose and hand-painteds will grow dramatically larger than northern-strain bluegill in an Alabama pond that is properly managed. 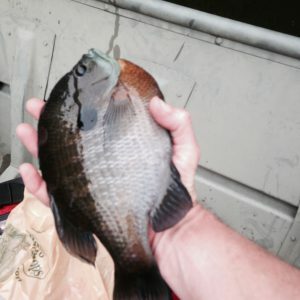 If you own a pond and you want the best fish, you owe it to yourself to stock our bluegill. 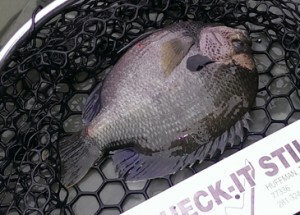 There simply is no other company that compares to Trophy Pond when it comes to bluegill quality. 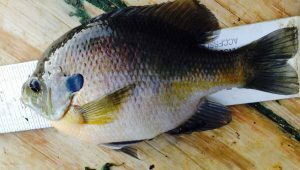 We are the only company in the world that commercially raises hand-painted bluegill, a rare subspecies found in the wild only in the Apalachicola River drainage in the Florida panhandle; this alone demonstrates that we care more about the awesome bluegill than our competitors. But we didn’t stop there: we also love coppernose, and know that many pond owners want them, so we made sure we would have the best coppernose of any hatchery in the country. We traveled to the St. Johns River three times, twice in 2015 and once in the spring of 2016, to catch our brood stock by hook and line, just as we traveled to the Apalachicola three times from 2013 through 2015 to catch our hand-painted brood stock by hook and line. When we started our hand-painted breeding program, we dug a new pond expressly for them, and had the hand-painteds in the pond within a matter of days after the pond reached full pool; we used the same process with the St. Johns coppernose. ; We go the extra mile to ensure our genetics are pure-strain.We have from the start and we always will. Need a quote for your Alabama project? 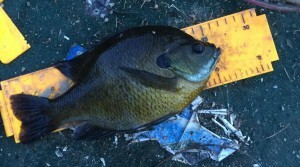 Like coppernose bluegill, these fish grow faster and get larger than northern-strain bluegill, and they make even coppernose look tame when it comes to their coloration. We sell northern, F-1, and pure Florida-strain largemouth from the finest hatcheries in the South. 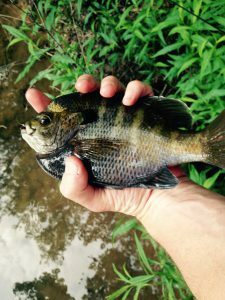 We also stock all of the following species: Redear Sunfish, Fathead Minnows, Largemouth Bass, Smallmouth Bass, Threadfin, Shad, Golden Shiners, Crayfish, Mississippi Grass Shrimp, Channel Catfish, Black Crappie, Hybrid Striped Bass, Tiger Muskellunge, Grass Carp / White Amur & Tilapia. 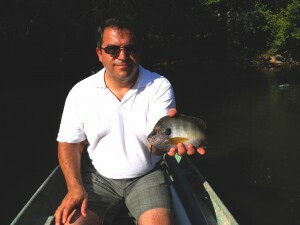 If it is necessary to sample a fish population, electrofishing is the most reliable and efficient method. Fisheries Biologist have been using electrofishing since the 1950’s to determine the health and growth in lakes and rivers. 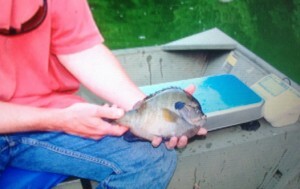 It has also become the first choice by management companies to sample their private ponds and lakes. The report for an electrofishing survey will include a detailed, comprehensive management plan tailored expressly for the specific pond or lake, based on the results of the survey, with your angling goals in mind. After all the testing is complete the resultant management plan will be presented as a PDF mini-book that is typically twenty-five to thirty pages long and includes full-color photographs that illustrate every aspect of the plan, laid out in order of when each action should be performed. 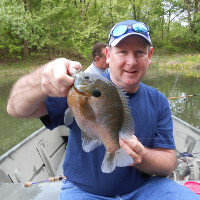 Call us today at (931) 374-0536 and let us transform your pond into the dream fishing spot you’ve always wanted! Weeds could have a detrimental effect on your pond. If you need assistance with weed control, we are a certified commercial applicator for aquatic herbicides, specializing in weed control. 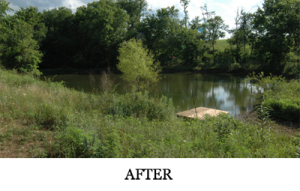 We will be able to give you your pond back to the state you want it to while doing it safely and professionally. 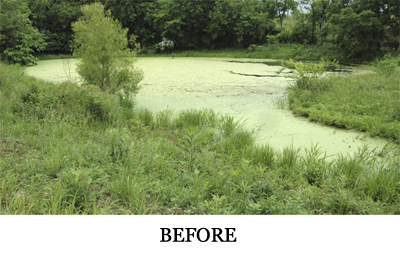 Aquatic vegetation can either help or hurt a pond. 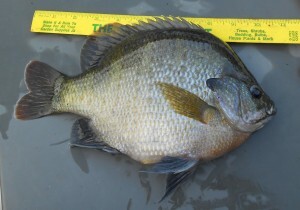 If you plant the correct vegetation it could help improve water quality and even promote bigger and healthier fish. 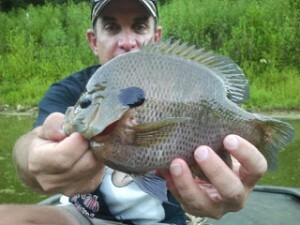 But there is also certain vegetation that could potentially kill every fish in the pond if it is left uncontrolled. Once we’ve identified what vegetation is present, we look further to determine the specific conditions in the lake that are causing that particular weed to thrive, and address those conditions: in other words, we treat the cause rather than just the symptom, so that the same weeds don’t return a few months or a year later. Ponds that have a lower alkylene level are subject to having the pH level vary too much throughout the day. Which in the long run will become too stressful on the fish.Liming is essential maintenance for ponds with aquatic life. It will maintain the alkalinity and pH levels which in return will help the fish thrive. 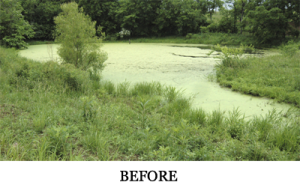 Ponds with alkalinity below 20 parts per million typically do not respond to fertilization, which in turn severely limits the food chain of the pond and therefore the pond’s overall carrying capacity. Monthly fertilization of your pond is a key component to having any success in pond fishing management, especially in the South. Fertilization is simply feeding the phytoplankton, the microscopic plants found in any pond, so that they greatly increase, creating what is known as a plankton bloom. This process will provide two major benefits: it prevents sunlight from reaching the pond bottom, thereby short-circuiting the photosynthesis of most aquatic vegetation which begins its life on the bottom; and it turbo-charges the food chain, allowing the water to support two to four times more fish than it could unfertilized. Ponds in the South should have a fertilize schedule of twice a month in the early Spring beginning in February or early March it all depends on the weather. They should also be fertilized monthly through September. 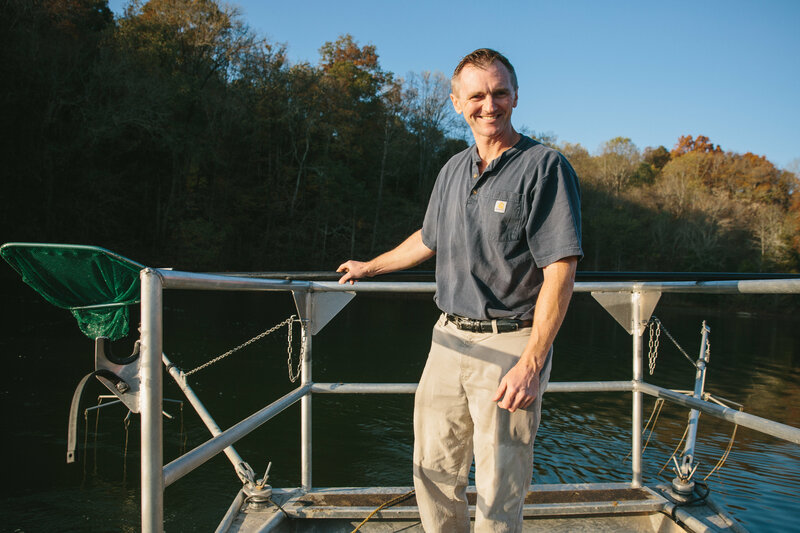 Trophy Pond offers monthly fertilization as a service for middle Tennessee, northern Alabama, and southwestern Kentucky. Do you have a current pond that is in need of repair? Or are you wanting to finally build that dream pond that you have always wanted? We have the experience and and trust to make sure it is done right the first time. Choosing the right builder for your pond dreams is crucially important – someone who is inexperienced or doesn’t understand ponds can cost you tens of thousands of dollars and months or years of stress and heartache. Don’t scrimp now just to be disappointed months down the road – do it right the first time with Trophy Pond! At Trophy Pond , we want our customers to know that we pride ourselves on attention to detail. While listening closely to the pond owner’s specific goals they want to achieve for their pond can mean the difference between a happy pond owner, and an expensive corrections that will need to be done years down the road. We want to make sure we get done right the first time so you can enjoy your pond and not have to worry about whether the integrity of the business that performed the service was on your side.We analyze every facet of your pond, from alkalinity to water clarity, from fish population dynamics to angling frequency and harvest load, from genetics to food chain to pond size and topography, to come up with a plan that’s completely customized to your specific pond and your specific goals. If you are planning a new lake, an On-Site Survey is necessary. These surveys consist of seeking solutions for aquatic vegetation, or assessing the viability of a property before or after purchasing. We’ll give you a management plan that includes lake design/renovation considerations tailored to your specific goals for the lake while at the same time factoring in the strengths and limitations of the property. Across the country there are thousands of guides who specialize in trophy largemouth. 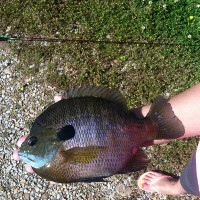 But we are they only service in the country that was started just for the purpose of catching once-in-a-lifetime, trophy bluegill. 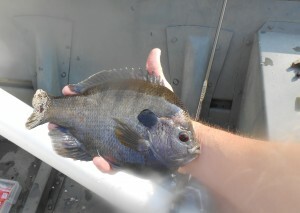 If you are on the search to catch that prized bluegill the odds are in your favor if you decided to go with us. 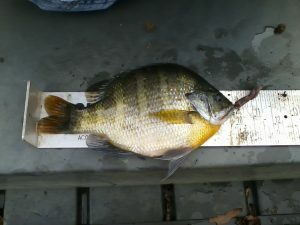 Catching over 20 ouncers isn’t out of the normal. Trophy Pond has been building and improving ponds since 1987. If you’re interested in wanting to grow bigger fish in a private pond, control the weeds in a community lake, or contract a sizable aquatic renovation for a government contract, we have the equipment, experience and expertise to get the job done right the first time. There are other local pond companies are perfectly content to keep using the same methods over and over again. They don’t have an interest in learning new techniques to better serve their customers. 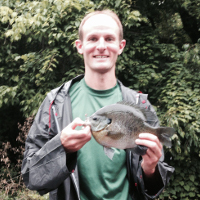 Here at Trophy Pond we are constantly innovating new strategies for helping our customers grow bigger fish, and to help better control their aquatic vegetation, and in general making your pond the dream escape you have always wanted it to be. We believe in building our business one satisfied customer at a time. 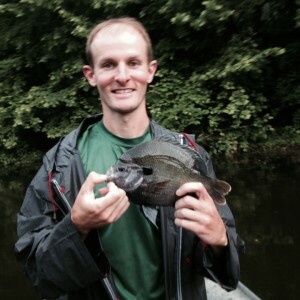 Give us a call today and let us show you the Trophy Pond difference! Mutt coppernose will have colors duller than either of their parent subspecies (coppernose and northern-strain), tending more toward the olive hues of northern-strain but often having more browns than pure northerns; purple is missing on the gill flap of males, as is the light-colored patch on the forehead. Fringing on the fins is noticeably absent, as are the wide bars on the sides. 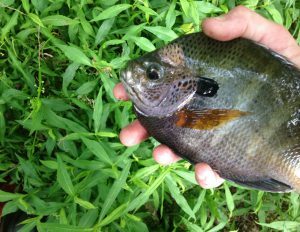 And the body shape is a dead giveaway for the mutts: if you catch an eight-inch bluegill from your pond that’s supposed to be a coppernose and it’s shaped just like a bluegill from the Tennessee River, you’ve got mutt coppernose in your pond.